« Why RR interval is irregular in Atrial fibrillation ? Echocardiogram in pulmonary HT has many aims . Estimate the severity of PAH. * For some reason RVH does not occur commonly in pulmonary hypertension , while LV hypertrophies promptly in systemic hypertension . At what pressure RV begins to dilate in PAH ? It is not known .It is highly variable . But most will dilate their RV at a systolic pressure > 50mmg. It is also possible the onset of TR and the magnitude of TR has a major say in the timing of RV enlargement . We know RV is more sensitive to volume overload than pressure overload . Paradoxically , it is often observed acute elevation in RV pressure dilate the RV faster than chronic ones. The tricuspid annulus is dilated .Note the severe TR with twin jet morphology. The Dabestani -Mahan ‘s equation* – The mean PA pressure = 90 – (0.62 X acceleration time). It is popular for calculating PAP by measuring pulmonary artery Doppler acceleration time . Many believe it is neither sensitive nor practical in real clinical setting. *Even though Dabestani is the first author of this paper Mahan got the full credits for the simple reason his name is easily remembered ! Note the peak TR jet is around 50mmhg and predicted RVSP would be 60mmhg.One would have expected still higher RV pressure but since the RV is dysfunctional the true PAP may be underestimated. According to Wyeman the following M mode signs are useful in diagnosing PAH. Currently , one may consider M-Mode echo to be an obsolete , but still the foundations help us understand the hemo-dynamics. Normally atrial contraction produce an inward movement* on the closing pulmonary leaflet . This happens because the MPA end diastolic pressure is usually lower than right atrial a wave .In severe PAH the elevated pulmonary diastolic pressure does not allow the atrial contraction to intend the pulmonary leaflet in pre-systolic atrial contraction .Hence pulmonary valve a wave in m -mode is diminished or even absent . * The motion we see in short axis M-Mode is that of left pulmonary cusp that moves posteriorly. 3.Dabestani A, Mahan G, Gardin JM, Takenaka K, Burn C, Allfie A, Henry WL. Am J Cardiol. 1987 Mar 1;59(6):662-8.
hypertension by a pulsed Doppler technique. Circulation. 1983; 68(2): 302-9. Soc Echocardiogr. 1989; 2: 157-71. 6.Yock PG, Popp RL. 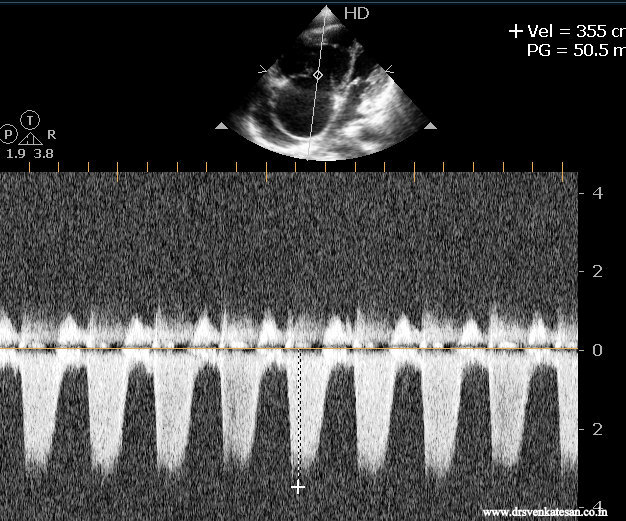 Noninvasive estimation of right ventricular systolic pressure by Doppler ultrasound in patient with tricuspid regurgitation. 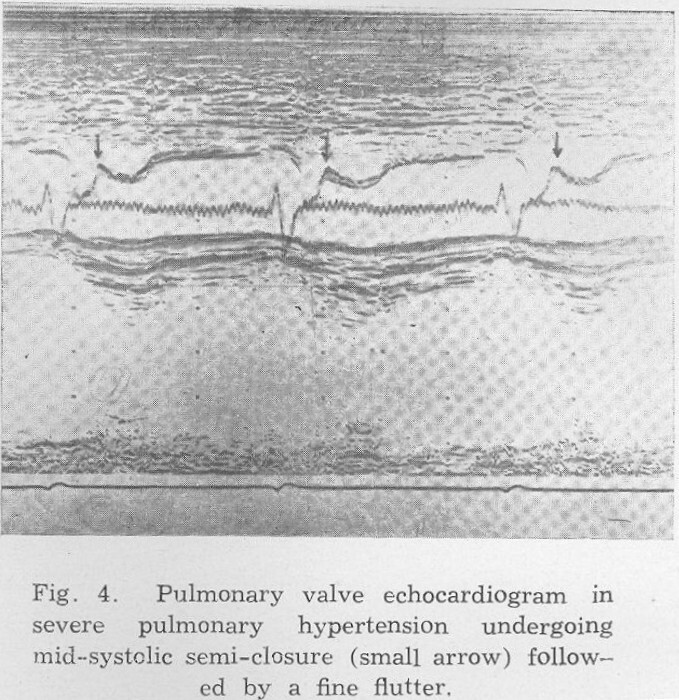 Circulation 1984; 70:657-62.
with PHT the RV hypertrophy initially but the RV contractility deteriorate rapidly bec. thinner wall RV in comprasion to LV so the RV dilate earlier.